Following on from the last post on medieval Markenfield Hall with its Tudor gatehouse, this time I’m a few miles north to focus on an earlier gatehouse, the enigma that is the Marmion Tower in West Tanfield, Ripon. Built and remodelled between 1350 and 1400, it stands tight between the drop to the River Ure and the wall of the village's church of St Nicholas, which may, or may not, explain why the barrel-vaulted entrance passage is off-set. Not substantial in footprint, it was substantial in comfort, having three floors, at least two garderobes built into its riverside walls, three fireplaces, and an oriel window. Although there were certainly gates, and it is crenellated – permission had to be sought from the Crown – there is no provision for either a portcullis or arrow slits. I’m not alone in finding this curious, considering the violence of the time. Like Markenfield Hall, it lies on the north-south road from Scotland, at a point where the Ure was crossed by ferry, now a bridge carrying the A6108. Was it built as a free-standing tower ‘house’, perhaps a dowager house with an enclosed courtyard beyond, specifically to be close to the church? Or was it built to be “of worth” – ie, not timbered – for a hall beyond, which was not, or became not, the owner’s main residence? Or, over the intervening years since the 1066 Norman invasion, were there two residences? Certainly something was built with commanding views on a rocky spur further along the bending River Ure, but that’s over a mile away. A motte and bailey ‘castle’ erected, as so many were, immediately after the Harrying of the North? Mmm. Personally, I go for the two residences theory. When John Leyland, the noted 16th century antiquarian, passed through on business for King Henry VIII, he was not impressed to find “a meane manor place” with a towered gateway and a house of squared stone. However the cossetted Leyland felt about the state of the manor dwellings, a look inside the church at the effigies of its former owners left me in no doubt as to the worth of the families who once resided there. While other chest tombs of the families are carved in eroding stone, this tomb, carved in alabaster, carries the effigy of John Marmion who, in 1387, died in Spain fighting for his overlord, John of Gaunt third son of King Edward III. It is, therefore, highly unlikely that his body resides within. Beside him is his wife, Lady Elizabeth, who died in 1400. In the foreground and behind their heads can be glimpsed parts of the decorated wrought iron "hearse" of unknown date, which carries thick candles at its four corners. As is usual in churches, there was neither the room nor the natural light to take full photographs, but it is from the spectacularly detailed carving that writers, and historians, gain much information of the period. While Elizabeth's head rests on a cushion supported by angelic cherubs, John Marmion's rests on his ornately feathered tilting (jousting) helm, carved out inside to look exactly as it had when he wore it in life. Note the interlocking shoulder sections of his plate armour and the tactile nature of his mail coif. Note, too, that both hands have been hacked off, while his wife's remain in prayer. Probably he was holding his - his - sword down the length of his body and it was subsequently robbed. Around his neck is carved the collar of the Lancastrian house, a decoration instituted by King Henry IV. This sort of attention to fine detail, and there is far more than I can show here, does not come cheap. So what happened to his, their, equally opulent dwelling? It seems that no documented explanation exists, at least that I've come across. If Leland's assertion in the 16th century was that the property/ies was "a meane manor place", then in all probability it was being allowed, for whatever reason, to fall into wrack and ruin. According to local tradition its usable stone was carried off to build other great houses in the area. It wasn't unknown. Thankfully the gatehouse was left where it stood, or people like me would never have heard of the Marmions, or be intrigued by the enigma of the Marmion Tower. Note: Click on the images to bring up a larger view. All photos (c) Linda Acaster. 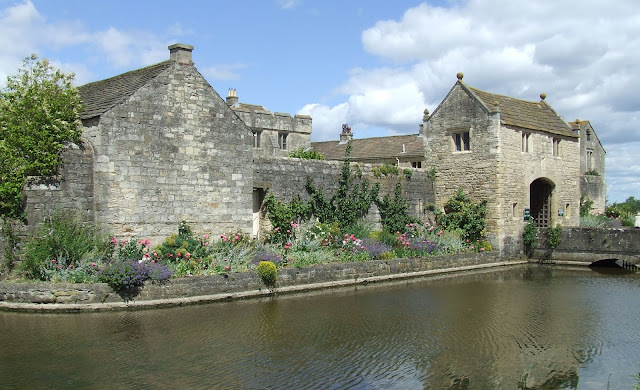 The medieval moated manor house of Markenfield Hall, three miles south of Ripon in North Yorkshire, is the last surviving of six said to have encircled the cathedral city. It is open to the public a mix of only 30 afternoons a year, so ours was a date not to be missed. The property – about 600 acres, then, as it remains today – pre-dates the Norman Conquest of 1066. William the Conqueror’s 1086 Great Survey (the Domesday Book) states that pre-conquest it belonged to Grimr and was worth 20 shillings; post-conquest to Bjornullfr (note the Scandinavian names) from William de Percy, and was worth 10 shillings. Its change in worth goes some way to indicate the upheaval, not only of the invasion but of the devastating scorched-earth ‘Harrying of the North’ of 1069-70 in retribution for the northern shires continued rebellions against the new order. The present manor house, of three known, dates from 1310. Its present gatehouse is Tudor and stands on the foundations of an earlier structure. Until the 18th century it still had a workable drawbridge. There was also an outer moat, now long filled in, no doubt enclosing the farm buildings which would have stood in exactly the same spot as the newer stone and the modern animal housings, just outside the drawbridge. A double moat was not excessive. The ink on Magna Carta wasn't a hundred years dry; John de Markenfield was a “king’s man” and the country was close to civil war as the northern barons flexed their considerable muscles. Also, the Scots were raiding annually to great effect. The courtyard - by a photographer who can't get her angles right. Markenfield Hall remains a family home, the family’s home after a re-purchasing following a spot of treason during the reign of Elizabeth I, which is why it is open to the public only a few designated days a year. The courtyard, though much changed, retains its original usage: stores, workshops and stables (now garage) to the left of the gatehouse, visitors’ accommodation (now the farm manager’s dwelling) to the right, the family’s great hall, kitchens and ancillary buildings ahead. As with all buildings of the period, for defensive reasons the original entry was made direct into the first floor via a covered outer stairway, the peak of its porch still visible in the wall of the great hall. Today’s entry is made via the ground floor undercroft, which lost much of its vaulting after being seized by the Crown and when internal walls were inserted to create usable rooms. A 20th century oak staircase now leads up to the great hall, renovated over a number of years into an enormous lounge. Visitors are encouraged to sit on the sofas and read the various histories of the people who lived here as well as of the Hall itself, before passing through the household chapel, still used, and into the first of the bedrooms, part of the original medieval solar, the private receiving chamber. Most stately homes and enormous castles feel like museums, but Markenfield Hall is on a scale to be enjoyed. As the quirky use of its nooks and crannies brings a smile – the vaulted utility room with its modern appliances; the cramped lock-up built into a buttress now a downstairs toilet – the lives of the men and women who lived here down the centuries brings widening eyes. Markenfield Hall has stood through a lot of history, and much of it remains ghosted into its fabric ready to catch the eye – and the imagination.